These shoes were given to me by my coach when I was in High School. And that would be 30 (thirty) years ago. I asked him today about the story behind them, but we couldn't come up with a definitive answer. At the time he was a good miler, but didn't have much money. It was customary at the track and field meetings to ask the professional, or sponsored, athletes for t-shirts and stuff, they usually had a lot of material for free. 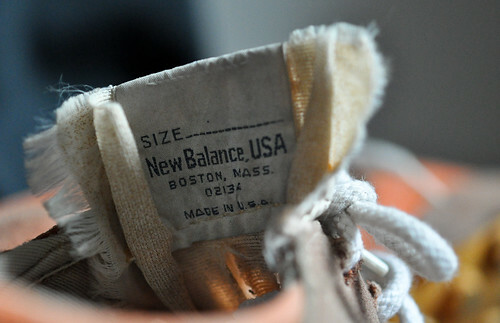 Anyway, New Balance, made in the USA (something you don't see that often nowadays in that market), when running shoes were just shoes one used for running. There were no discussions, nor awareness, about support, minimalism, overpronation and so on. I remember going for the lightest I could find, and just running. Being a gift, I didn't want to abuse these shoes, so I ran in them only a few times and remember absolutely loving them. Light, responsive, with a touch of cushioning. Now they are slowly dissolving, but still great to look at from time to time. They bring back great memories.